Joe Biden Just Ruined Hillary! Watch Him Crumble In Interview! Now that was funny! lol He didn't hide how he feels. I can't remember when I last saw Biden speak about anything, so odd. I'll watch the first one later when I get back. The FBI obtained a warrant to search emails related to the Hillary Clinton private server probe that were discovered on ex-congressman Anthony Weiner's laptop, law enforcement officials confirmed Sunday. The warrant came two days after FBI director James Comey revealed the existence of the emails, which law-enforcement sources said were linked to Weiner's estranged wife, top Clinton aide Huma Abedin. The FBI already had a warrant to search Weiner's laptop, but that only applied to evidence of his allegedly illicit communications with an underage girl. One eyed Harry needs to stick a fork in his good eye. The FBI accelerated its timeline for reviewing emails potentially linked to Hillary Clinton on Monday amid growing public pressure over the agency’s surprise announcement that it had found them in an unrelated case. Investigators had planned to conduct the review over several weeks but, after a torrent of criticism over the weekend, began scrambling to examine the trove of emails, according to law enforcement officials. The FBI hoped to complete a preliminary assessment in the coming days, but agency officials have not decided how, or whether, they will disclose the results of it publicly, and officials also could not say whether the entire review would be completed by election day. Wikileaks just tweeted that the IRS in Dallas is also investigating the Clinton Foundation. This may be old news but I have not heard about it. I can not believe HRC is still a candidate for President. It seems if you are being investigated by the FBI, DOJ & IRS -- you would be disqualified. I suppose you have to be charged first. If she were smart (and still has a valid passport) she would get on that (leased) plane of hers and head for the country where she's transferred the most money to -- from the foundation. I guess she thinks she is going to win this thing, and wiggle out of all her corruption. IF Crooked Hillary (and her gang) were smart.. they would have taken the money and left the game... but they are greedy.. wanted an even bigger pay-out with Crooked Hillary in the White House. Running for President was bound to draw attention to them. I guess they assumed the opposition would be a Beta Cuck like Jeb? Hillary knew that Congress and judicial watch were going to persist investigating Benghazi>>>> illegal email server. The ONLY hope she has to avoid prison is to become President!! 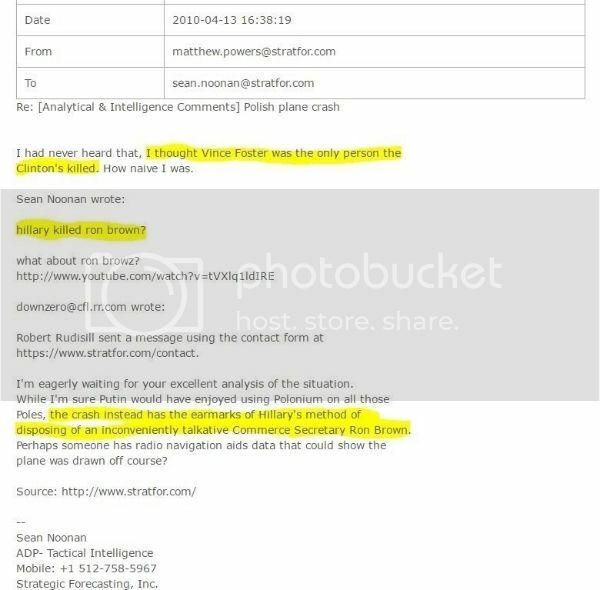 Referencing the death of Vince Foster & Ron Brown. Tonight, Wikileaks released 8k more documents (not just emails) called DNCLeaks2. As THIS document was going around on Twitter, wikileaks.org was taken down (still offline). Minutes later Twitter went down. Ahhh..... see now peeps are actually watching. I am afraid it is too late. She is truly a psychopath!!!!!! James Comey had better ask Trump for asylum in one of his towers until Trump assumes the presidency. Rumpole you should put the "What difference does it make" video on Gab! Love it, short and to the point. Think her laugh should have been at the end. I can remember watching that particular hearing, and her nervous laughing. In dashing through his last few weeks in office, will one of Obama's final acts be to pardon Hillary Clinton for any violations of federal law she might have committed while she was secretary of State? It's an interesting and complex question. We should first note that the Obama administration's decision not to prosecute Clinton would not bind the Trump administration. Until relevant statutes of limitations have expired, she could still be prosecuted by the new administration. It is possible, in my opinion, for Clinton to be prosecuted for either her improper handling of classified information on her "home brew" email server or allegations of "pay to play" arrangements between the secretary of State and donors to the Clinton Foundation, which could constitute bribery. But there is a downside, and it isn't trivial. A pardon must be accepted by the person who is pardoned if it is to effectively stymie any prosecution.